Roses are the Queens of the flower kingdom. They reign supreme over all other flora, guarding their beauty with deadly thorns. Roses are also prolific, boasting thousands of varieties in different shapes, sizes and colours. The roses in perfumery are just as bountiful as those in nature, with just about every perfume house boasting their very own rose fragrance or two. Why? I hear you ask. Well, in addition to being pleasant to look at, roses also smell blooming marvellous and they lend themselves to perfumery like a versatile moulding clay that can be used to build a huge variety of beautiful smelling structures. Someone else who appreciates the undeniable beauty of roses is Terry de Gunzburg. Beauty is TdG’s thing. As an award winning makeup artist and the former Creative Director Yves Saint Laurent, she knows a thing or two about making things pretty and she has applied this hard earned knowledge to her collection of perfumes. Two of the standout pieces within her already rather extensive line of fragrances are Rose Infernale and Rouge Nocturne, both of which are vampish, vixen-inspired scents that are so fragrantly fabulous it almost hurts. Let’s put them to the test. Well, isn’t this a wonderful throwback of a scent? One spritz and I’m taken back to the powerful, dusty chypres of the 1980s, a time where bigger was better and complexity was the modus operandi. Rouge Nocturne feels like a modern taken on Estée Lauder’s Knowing but it’s less business-like and much softer. It’s exotic, opulent and a touch scandalous, three qualities that always make for an intriguing olfactory experience, and intriguing just about sums up Rouge Nocturne to a t.
Rouge Nocturne opens sweet and liquorice-like with a hazy and cloudy texture. It quickly reveals a large rose note that is spicy and juicy in an edible, rose-water sort-of way. Instantly one thinks of gigantic pieces of ruby red velvet, luxurious pieces of heavy fabric that have a dappled appearance that changes hue as the fibres change direction. Underneath all of that rose is a cosy bed of snuggly amber and feathery patchouli. All together, Rouge Nocturne has a vampish Liz Taylor vibe that is utterly fabulous, fashionably unctuous and undeniably fierce. Give this one a shot if you love old school chypres and have a touch of the vamp about you. 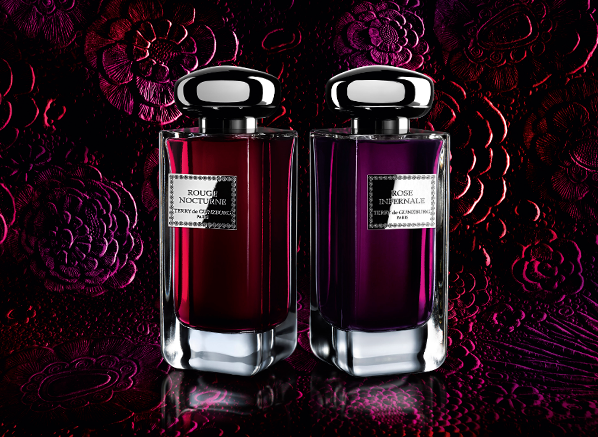 I feel that Rose Infernale is the yin to Rouge Nocturne’s yang. 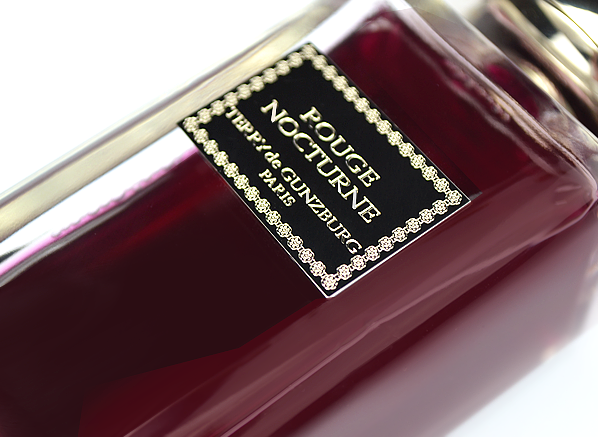 Where Rouge Nocturne is all blowsy and old school, Rose Infernale is more structured, robust and modern. It’s also the more masculine of the two. If I were to compare Rose Infernale to another fragrance, I’d say that it was spicier version of YSL’s tremendously androgynous Nu – an austere take on florals and incense. 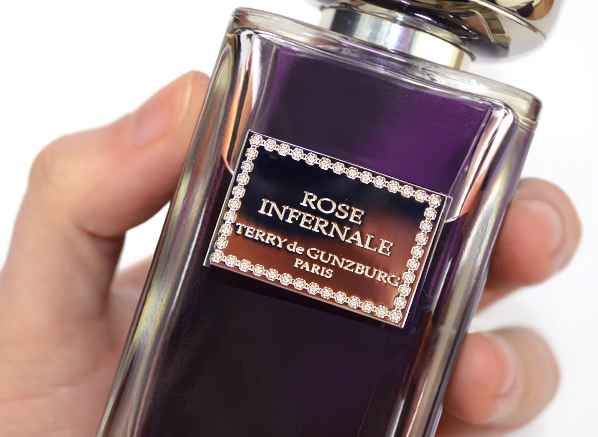 Terry de Gunzburg’s take on the spicy floral-incense genre is much sharper and a little bit more rough around the edges. It presents middle eastern opulence in a modern Blade-Runner style. It’s futuristic but in a fantastical way. Rose Infernale starts out peppery and sharp with nose-tingling spice and citrus. Straight away, it has a rich and oily texture that is incredibly exotic. Unlike Rouge Nocturne, the Damascena rose is a supporting player here rather than the main focus and it adds a deep warmth that hums along nicely in the background. The stars are in fact, the incense and vetiver, with the incense bringing weight and heaviness, and the vetiver cutting through with a rooty sharpness. What one smells is a spicy floriental with a strong attitude and a thoroughly modern sensibility. Give this one a shot if you love a bit of spice in your life. This entry was posted on Wednesday, February 3rd, 2016 at 10:38 am and is filed under Candy Perfume Boy, Fragrance, Tried & Tested. You can follow any responses to this entry through the RSS 2.0 feed. You can skip to the end and leave a response. Pinging is currently not allowed.